When designing our second activity, our group aimed to find out the degree to which it was difficult to make connections. We also wished to incorporate critical thinking and collaboration. These are two things our team determined to be crucial in developing the ability to make connections. Originally we thought of multiple ideas that could incorporate these, some of which included sports and music. However, after brainstorming we decided to bring an activity that was broad enough to appeal to multiple interests and afford the use of different skills. We also took into consideration that many of these students have a Caribbean cultural background. Therefore, we thought that it would be appropriate to create an activity in which the students would pretend to be trapped in an island after a plane crash and had to find their way to rescue. The biggest challenge in creating this activity was taking an idea that had a lot of potential and setting up the appropriate rules and constraints so that the activity was successful. That is, there were many ways in which we could mold this activity for it to be constructive. As a result, our team ended up testing a few of the ideas and then making assumptions based on our previous activity on how the children could react. After that, we determined all of the possible negative and positive effects of the different approaches that we considered practical and slowly began to add and remove constraints until we had a pretty solidified structure for our activity. 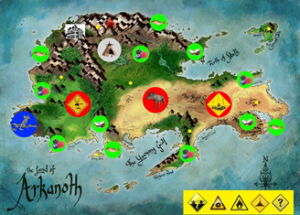 In order to give our game structure, we created a map that included different icons that symbolized possible positive (green icons) and negative (red icons) outcomes when you landed there. Some of the green icons included berries, water, etc. some of the negative icons included different animal attacks, etc. and some icons where left neutral such as the mansion and the indigenous people. These icons along with some yellow icons that symbolized some sort of natural disaster were scattered along the map. The goal of the game was to make it to the other side of the island after getting some water food and shelter. We hypothesized that with this game structure many of the students would be encouraged to work together to build things or think about survival skills and how they could incorporate the different things in nature and the things given by the icons to get food, water, and shelter, and to the other side of the island quickly. However, when we started the game we realized that we underestimated the amount of time it would take for the children to figure out the fastest way to get to the other side. We also realized that because of the icons we had given them, it was easy enough for them to find water, food, and shelter without having to build or come up with anything. Fortunately, our game was flexible enough that we were able to make up new rules on the spot to try to get more of the outcome we expected. As we switched around the rules we noticed the activity worked a lot better when the children had more of our guidance and attention so we decided to break the group up in two and have two different activities. Half of the team played bowling and the other half stayed playing the map game. For the map game, we decided it would be more engaging if we had two teams competing against each other to get to the rescue first. We gave each team a map and we made the rules so that the teams would take turns making a move so the opposite team was aware of their strategy. The children had to discuss the strategy with the team and analyze all of the possible outcomes of each move. We also decided to incorporate chance into the game so that it made the game more exciting and could keep them playing for longer. That is, we decided that every time they chose to move to a yellow icon they had to flip a coin and if they got heads that meant the natural disaster hit and they had to go two steps back. If they got tails, everything stayed normal. Additionally we decided to incorporate the collaborative building and survival skills by giving them an option to skip a turn to build a boat or a shelter. We also added random natural disasters whenever the teams where advancing too quickly and made it mandatory to flip a coin at the end in order to be rescued. This made the game more leveled since some teams were able to figure out things quicker than others. If the quicker team got to the end too quickly they still depended on chance to win which gave the slower team the opportunity to also participate and develop a strategy. The results of these changes were surprisingly positive. Although reorganizing was a struggle, the children showed a lot of interest once we did. Some of the children volunteered to play again. One of the boys who was really into the game went further on to explain the different ways in which he could use the materials from the plane and the things from nature to build fishing nets and other tools. Another one of the boys won the game straight by luck; his team decided to take the risky steps every time where they had to flip a coin but always called tails correctly which led them to win the game almost immediately. Additionally we would keep track of everything the teams did and made them question every one of their moves. We would make them think twice and talk to each other before making a decision. 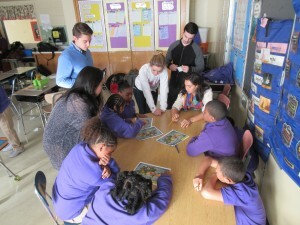 We also gave them advice and got really involved in order for them to stay excited. The only problem we faced when we changed the game was that some of the children kept our coins and then more children would come up to us to ask for money. Although this game proved to be successful in developing critical thinking and collaboration, there are still many alterations that could be done to the game to target different learning goals. However the instructor should keep in mind that the game is more fitting for a small classroom scenario since we concluded that it requires a lot of the teacher’s attention in order to succeed. . Ideally, this game could serve as a template for teachers to target different skills depending on the constraints assigned.